In the 4th Test match against England being played at The Rose Bowl, Southampton, Team India bowled out the hosts for 246. Before tea, England score was 139 for 6, however, the English batsmen couldn't survive the attack by India pacers and were only able to put up a total of 246 in their first inning. In the 5 test match series, England is currently leading the series by 2-1, therefore, for Team India it is important to win both 4th and 5th Test matches to claim the series. Team India on day 1 of the 4th Test match against England bowled out the hosts for 246. The 4th test is being played at The Rose Bowl, Southampton. Indian pacers put up a good show on day 1 as they did not let a single English batsman to settle up and continued taking wickets at regular intervals. At tea on day 1, England was 139 for 6 while the remaining four wickets also fell soon after that. Indian pacers including Jasprit Bumrah, Ishant Sharma, Mohammad Shami did the job for Team India and bowled out England at 246. Earlier in the day, England captain Joe Root won the toss and elected to bat first, however, by the end of the day, since England failed to put a major score, it doesn’t seem that skipper Root’s decision really helped the team. While on the other side, for Team India, it is going to be an advantage to hold the game and should not lose this momentum to take a lead in the game. 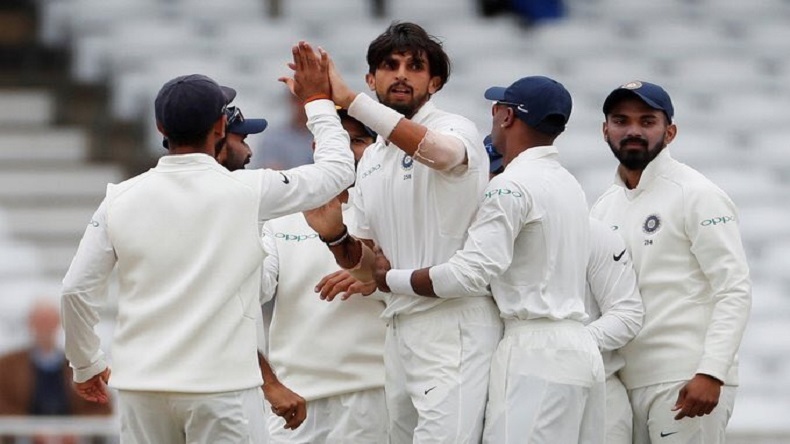 Indian pacers including Jasprit Bumrah, Ishant Sharma, Mohammad Shami rattled England’s entire batting line up as the hosts were able to put up only 246 in their first innings. Among the early falls, Bumrah took Keaton Jennings’s wicket and sent him back to pavilion for a duck, while his partner Jonny Bairstow also couldn’t perform and lost his wicket after scoring just 6 runs. Following a perfect spell by Bumrah, Ishant Sharma also did not allow English batsmen to settle up and dismissed Joe Root. Post lunch, seamer Mohammed Shami took the wickets of Jos Buttler and Ben Stokes (23). However, Sam Curran and Moeen Ali’s 81-run partnership did help England to cross 200 mark. But the batting line up couldn’t survive for too long as the entire team was bowled out for 246.